Himalayan Hands put a lot of effort into training and preparation for the expedition. This training took many forms including: First Aid, Language, Kit, Culture, Health and Hygiene, and Physical fitness. The first HH training weekend was an initial bonding session and recruitment drive, setting out the likely projects to be undertaken and getting people enthused for a 4 week community project in Nepal. This training session spurred the recruitment of the rest of the delegates through word of mouth. The second HH training weekend was much more focused, and now with the likely projects set, the delegates were asked to pick from one of seven project teams each doing different work in Nepal. Phortse was one of those teams. We were lucky in having guidance from experienced people in all of these fields including Nepalese speakers in later weekends. The third HH training weekend concentrated on developing team spirit while continuing to give the basic expedition training necessary for each group to survive in Nepal. Sessions continued in the basic training areas, with short refresher sessions for those that felt they needed more training in any particular area. With a native Nepali speaker throughout this weekend we were able to ask more details about the language and the culture of Nepal. This was the final joint training weekend allowing the opportunity to tie up any remaining loose ends before setting off for nepal. We were lucky in that Tony Freake and his wife were able to attend this weekend giving us a very detailed run down of what we could expect at Phortse and helping us to organise our team logistics. A slide show of Nepal and Phortse was also given to the entire expedition offering a great sense of adventure and anticipation for our journey ahead. 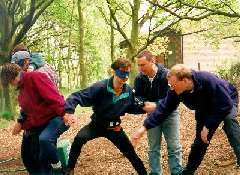 Early in 1999, 16 members of the Himalayan Hands expedition attended a detailed expedition first aid course. This course was run by professional expedition first aid trainers over a wet weekend in Burnley. Expedition first aid is first aid like you have never seen it before. Start with the premise that you are far from help, there are no ambulances or hospitals within hours reach and the western first aid ideas of what you can and cannot do have to be ditched. From straightening broken limbs to eye injuries, infections to hypothermia, diseases to diabetes. We dealt with almost everything that could go wrong on an expedition the common things such as tripping to the not so common such as rabies. The list of drugs alone and there uses seemed to go on for ever. How much of these medical supplies could we even carry up a mountain. As it turned out quite a lot. And the stethoscope did come in useful. The weekend was draining and the list of things that could go wrong while on expedition had us all wondering if we could come back alive. But forewarned is forearmed so they say, and the training gave us the confidence in our own abilities to manage problems in the wild.